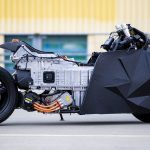 We have seen a fair number of creative electric motorcycles, but the Leafy Savage Custom Electric Motorcycle you see here tops all that we have see thus far. 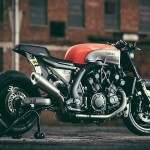 For starter, the bike was created mostly by one man, Matt Candler under his outfit called Night Shift Bikes, and perhaps more amazingly, it is a creation of a person who has no real background or whatsoever in bike building until 2006. Matt’s second ground up (and third) custom build is a serious head turner – thanks in part for the skeletal look and also the unmissable bulk at the center of the frame (not exactly idea, but looks cool anyways). 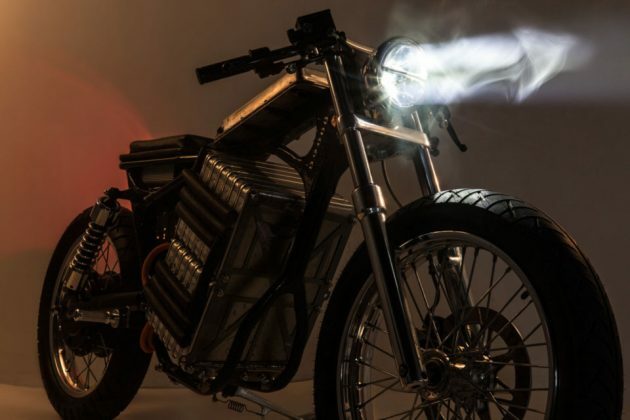 What makes this Night Shift Bikes custom electric two-wheeler so unique is, it is essentially a mash up of an electric car and a fuel-guzzling motorcycle. 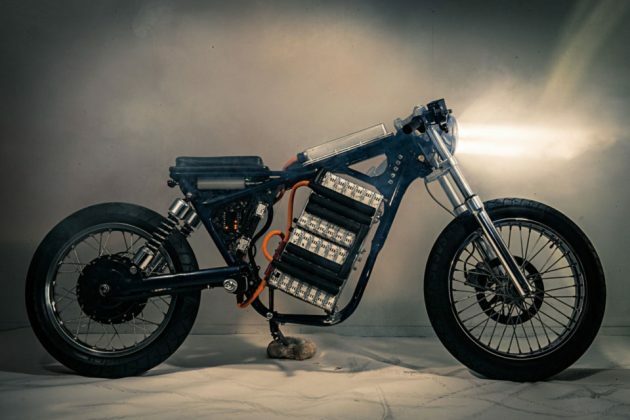 The electric car in this case is a Nissan Leaf, which contributed one of many critical elements: the battery, and the motorcycle donor is a 2003 Suzuki Savage, which was taken apart and parts sold to fund the build. 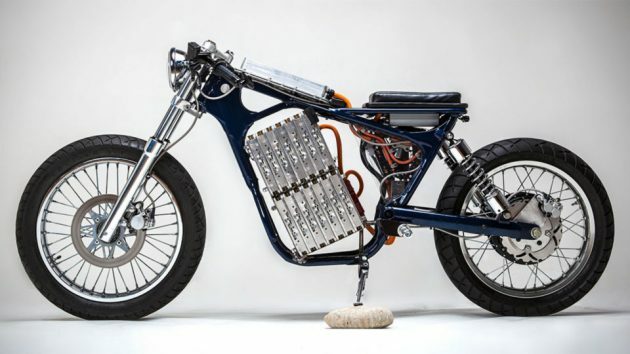 In all, Leafy Savage is outfitted with no less 14 cells, each with 4 flat-pack lithium manganese oxide batteries, hooked up in series to yield a total of 116 volts. Where the fuel tank used to be, it has an Eltek charger that can provide up to 3,000 watts at 220 volts but it is, for now, rigged for 110 which is suitable for standard U.S. household outlets. 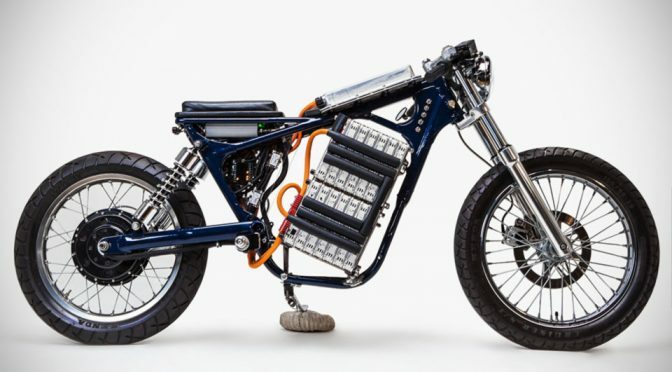 A 250A-rated Kelly controller found under the Karl Vosloh seat regulates the electricity between the battery and the motor, which is a hub motor built by Enertrac that produces up to 40 horses. 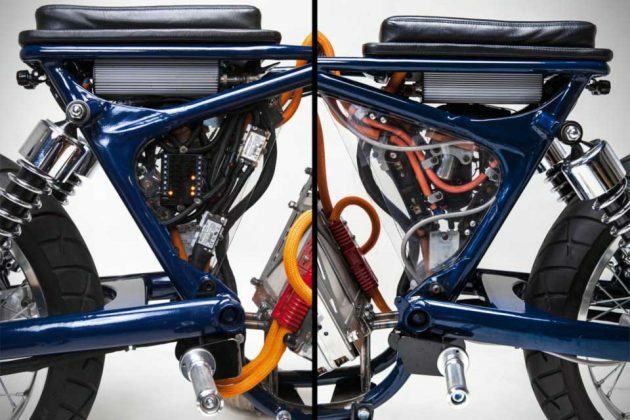 And it has regenerative braking too. 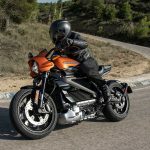 As of now, Leafy Savage is setup to be quick and offers a “balanced city riding” with a range of approximately 100 miles (160 kilometers), but it can be further tweak to suit the rider’s desired ride style. 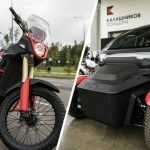 Other notables include motogadget’s m-unit, m-lock wireless key, m-button, LED lighting, rear disc, toggle switches, modified kickstand, and suspension set by RYCA. No words on the availability and pricing, though. 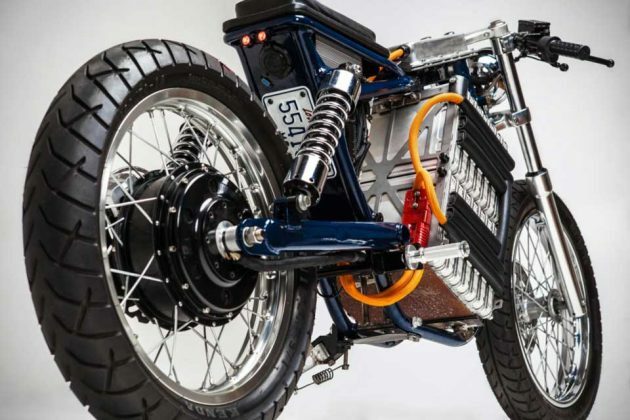 If you are interested in this custom electric motorcycle or any other custom electric two-wheeler build, you can reach out to Matt to find out more.